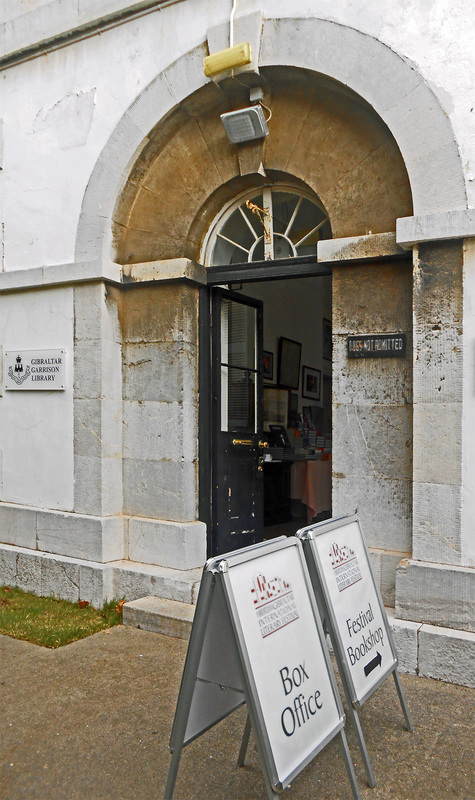 The venue for our talk was the beautiful historic Garrison Library, where we have spent many hours doing research. Full of atmosphere, it was the focal point for the festival and provided the ideal setting, because it was originally founded by John Drinkwater. He served as an ensign in the 72nd Manchester Regiment throughout the Great Siege and kept a meticulous diary that became a bestseller in his own lifetime. See our newsletter 50 for a description of him and his involvement with London’s Regent’s Canal. Tickets for our talk sold out early on, even though the organisers managed to install extra seating. On the day, there was standing room only, with an audience that included VIPs, Gibraltarians and visitors and tourists from Spain, Britain and elsewhere, along with photographers and reporters from the media. Before our event, we were nervous about how our talk would be received in Gibraltar, where the people are very knowledgeable about their own history. Instead, we were overwhelmed by the enthusiastic response, not just in the lively Q&A, but also at the book signing and in the days that followed. 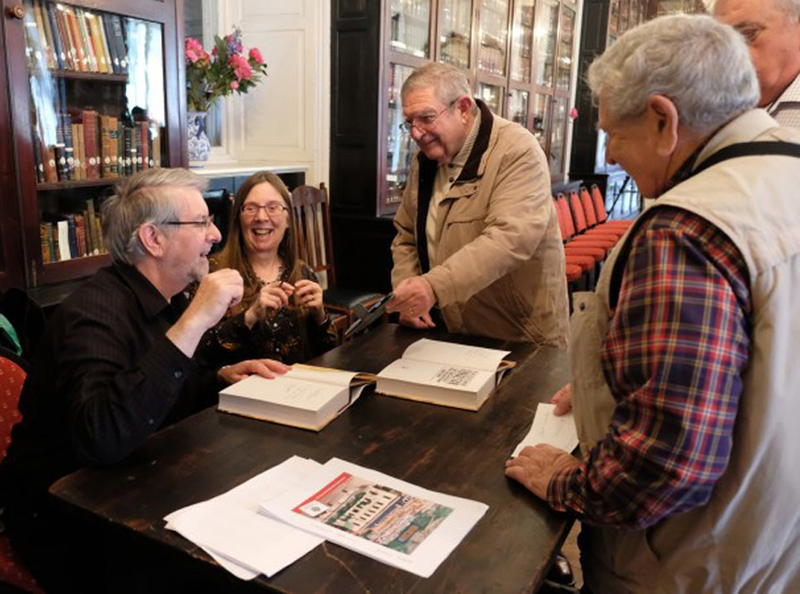 Once the talk and questions were over, we sat meeting people and signing books they had bought in the adjoining festival bookshop run by Blackwell’s, a very enjoyable experience that seemed to go on forever. Afterwards, we learned that several members of the audience bought additional books and then queued for a second time to have them signed. By the very last day of the festival, Blackwell’s had sold every single copy of our book. We are grateful to everyone who took the trouble to waylay us in the street and elsewhere to tell us how much they had enjoyed our talk or were enjoying the book. 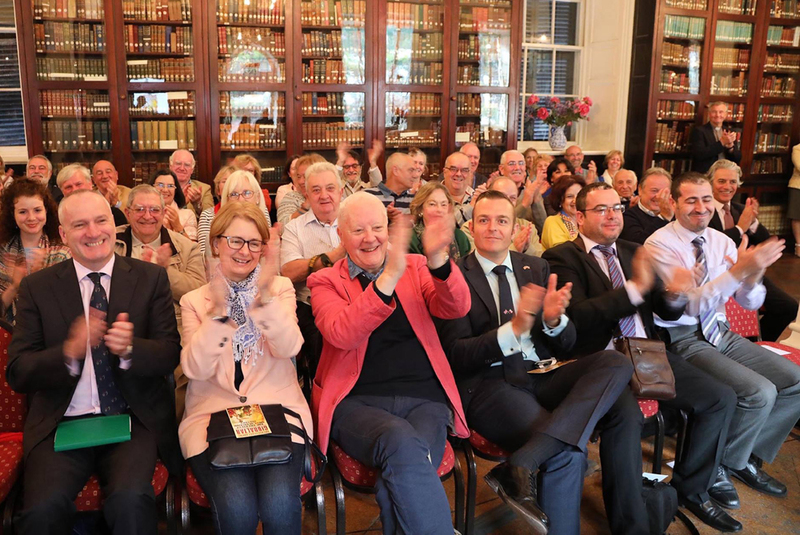 Usually at festivals, speakers have little opportunity to stay on and so rarely hear any feedback, but the Gibunco Gibraltar International Literary Festival encourages speakers to stay for the entire festival. There is also an Education Programme, giving children an opportunity to meet authors. We had the privilege of speaking to seventy boys and girls from year 2 at Governor’s Meadow School. For 45 minutes we chatted to them about the Great Siege and Egyptology (an interesting mix! ), and they were brilliant, very focused and with lots of questions. We look forward to meeting them again. Our overall impressions are of sunshine, the sea, friendliness, a warmth of welcome, superb organisation and a huge interest in books and talks on all sorts of topics. For anyone thinking of having a holiday at the festival next year, then we would also say that it ranks as one of the most fascinating locations, on the edge of Europe, with plenty of other things to do and see as well. It was certainly the best literary festival we have ever taken part in.